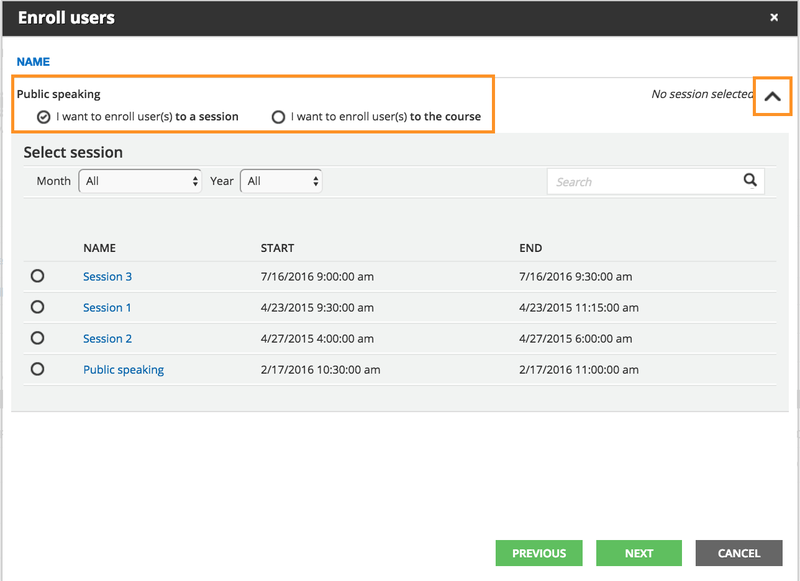 This article will show you how to enroll users into your E-learning courses in your Docebo LMS. Once you have created an E-learning course, you can begin enrolling users to the course. Begin by accessing the Admin menu by pressing the gears icon the left sidebar. Then, select the Courses item from E-Learning section. On the main courses page, you will see an action bar at the top of the page as well as a list of courses on the bottom half of the page. From here, there are three ways to enroll users into courses. You can enroll multiple users into multiple courses, enroll users into a single course, or enroll users into a course via CSV. Let’s explore all three processes. In the action bar on the top of the page, select the Enroll Users button. In the pop up box, begin by selecting the users that you want to enroll in courses. Flag the check box in the user’s row to select the user. You can also flag entire groups or branches using the corresponding tabs in the pop up box. Then, once you’ve selected the users, press the Next button. Now, you need to select the courses in which you want to enroll the selected users. Again, flag the check box in the course’s row to select the courses, then press Next. Now, if you have selected an ILT Classroom or Webinar course, you need to select a session into which you want to enroll the selected users. 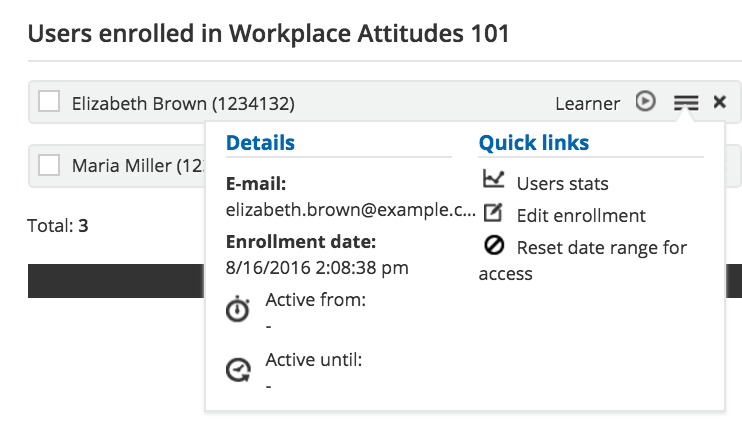 Select the arrow from the course’s row, then flag whether you want to enroll the users into a specific session, or simply enroll them into the course. If you flagged the option to enroll the users into a session, you will need to select which session using the list that will appear. If you flagged the option to enroll the users into the course, you will need to go to the Sessions Management page of that ILT or Webinar course in order to assign the users to different sessions. When you’re ready, press Next. 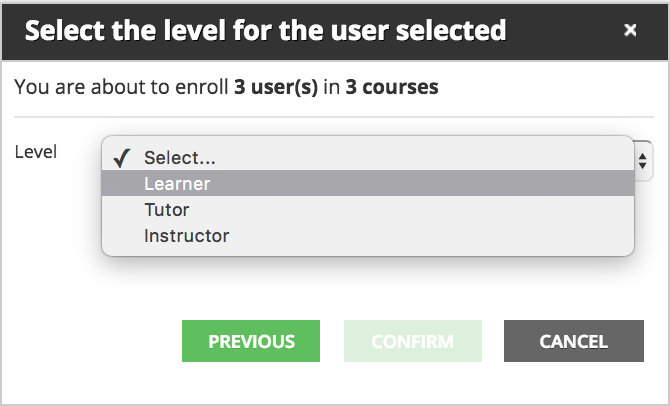 Finally, you need to select the level for the selected users: Learners, Tutors, or Instructors. Once you’ve selected the level, press Confirm. You’ve now enrolled multiple users in multiple courses. To enroll users in just one course, access the main Courses page in your platform, then find the course in the lis of courses. 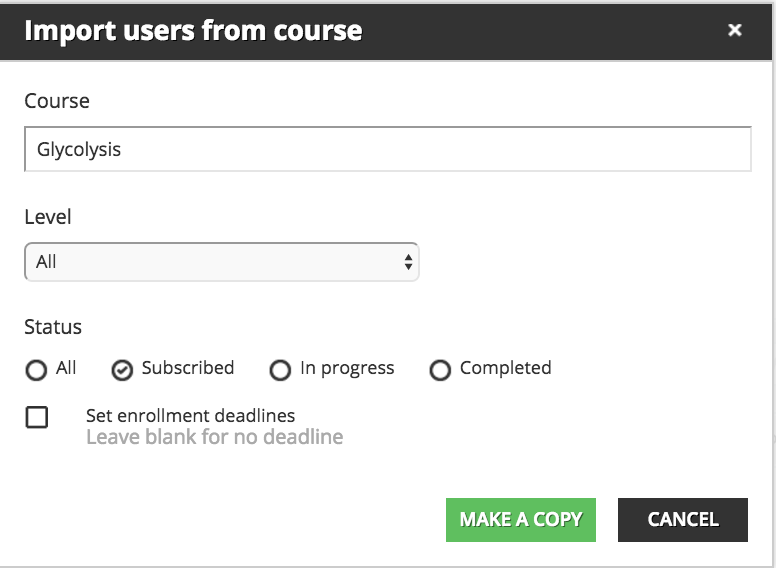 In the course’s row, press the Enroll button, or press the number displayed in the Enrolled column of the course’s row. You will then be redirected to the course’s main Enrollment page. In the action bar at the top of the page, select the Enroll Users button. 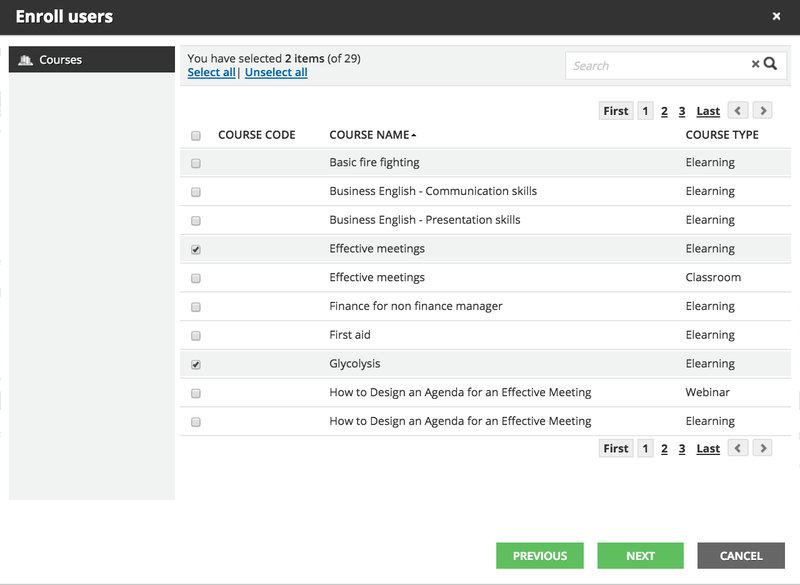 In the pop up box, select the users that you want to enroll in the course. Flag the check box in the user’s row to select the user. You can also flag entire groups or branches using the corresponding tabs in the pop up box. Then, press Next. Now, assign a role to the enrolled users: choose between Student, Tutor, Instructor. Instructors can manage training resources, course widgets, analyze student activities. You can also set a deadline for the enrollment. If you flag this option, you will then need to establish an end date for the users, thus un-enrolling them from the course after the date you selected. When finished, press Confirm. Now the enrolled users appears in the list on this course’s Enrollment Page. You can un-enroll the user from the course by pressing the X next to each user’s name. If you press the menu icon next to the user’s name, a menu will appear, giving you quick stats and quick links to edit the user’s configurations for this course. You can also import users into a course form another course. 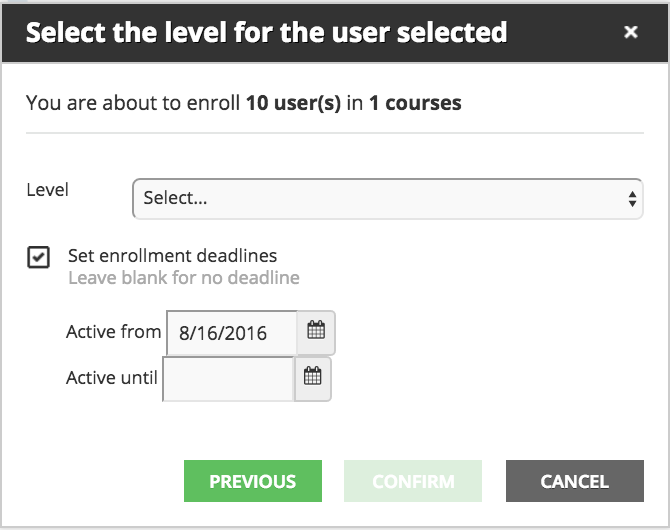 To do so, press the Import users from course button in the action bar at the top of the course’s Enrollment page. In the pop up box, type in the name of the course from which you would like to copy the enrollments. Then choose which user roles and user statuses you would like to copy. Then, press Copy. Your newly enrolled users will appear in the list below. The last enrollment option is the Enroll from CSV. 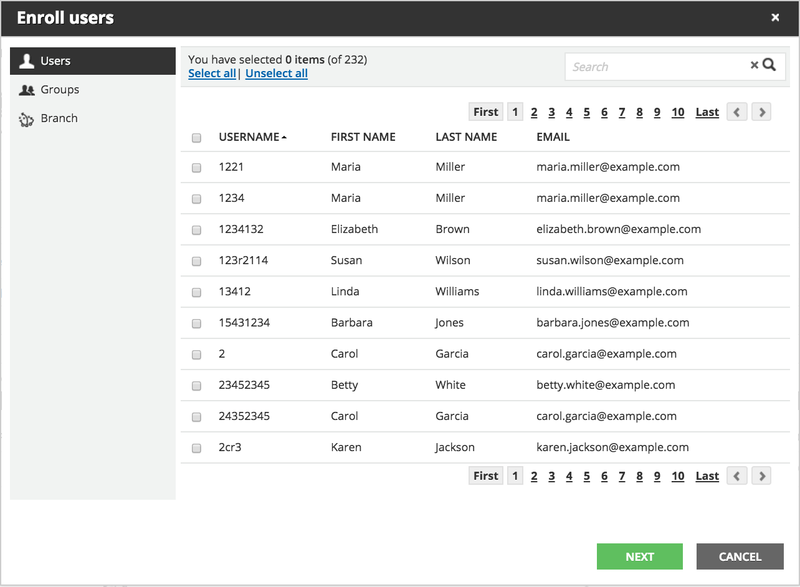 This allows you to upload a CSV file from your computer with the usernames of users you would like to enroll in this course. In the action bar at the top of the course’s Enrollment page, click the Enroll from CSV button. Remember: These users must already be registered in your platform in order to perform this action. Click the Browse button to find the CSV. Please note that the CSV file must have one username per row. Once you have done, click Upload File(s). The users will then be enrolled into the course, and you can edit or un-enroll them as necessary.